It was pretty cool watching the practice and checking things out behind the scenes. I created a Flickr photoset of pics I took if you're curious. Here are my questions and Justin Pogge's answers. Q: Do you read what they write about you in the press? Do you have a Google Alert for your name? A: No, not really. I read the newspapers, but I don't have a Google Alert for Pogge or anything like that. Q: What do you really think of the current plan to bring you up for a game here and there but to send you back to the Marlies right away no matter how you play? A: I think it's great! There's no pressure. Sure, it would be nice to stay up, but it's a good strategy. Q: Are you playing tomorrow night? A: Yeah, for the Marlies. Q: What was the explanation that Greg Gilbert gave you for going with Clemmensen in the AHL playoffs last year? A: Clem was hot and he carried us through the first two rounds. You have to go with the hot hand. Q: What was your favourite team when you were a kid? A: I moved from Alberta to British Columbia, so my favourite teams were the Flames and Canucks. But I liked all the Canadian teams. Q: What role does Curtis Joseph play when you're up for one of your fly-by, drop-in performances. Are you buddies? A: He's great, we can talk about anything. And he's got a wealth of knowledge and experience. We're buddies. Q: What's the biggest adjustment you've had to make moving to Toronto? A: Ha! The first year was tough. I didn't even know where to buy a lightbulb! It's definitely a big city, but now I don't find it as overwhelming. Q: What's your favourite beer? A: All of them! There's a pilsener out West you can't get here that's probably my favourite. Q: What's your favourite band? A: Led Zeppelin, Kiss, The Rolling Stones... Of the new bands, my favourite is probably Queens of the Stone Age. Pogge wins big points for the Queens comment! Good interview. Why's he holding his crotch in the pic? I guess he's used to getting hit there. No arm around the guy? Would you have a bromance with him? Looks like you guys are afraid of the Man Lovin'. Arms around the shoulders would've been alright. Unless he warned you ahead of time not to do it. After the interview, I asked if I could get a picture. Justin was happy to do it. He didn't give me any "don't put your arm around me" or "no man lovin" rules. But, we had just met for the first time, and it wasn't really a social setting, it was a "meet and greet and interview". So... I decided not to put my arms around his shoulder. Unlike the time I met Tie Domi. Did you ask him what it's like to be mired in an organization that has an impressive success rate at ruining young prospects? That's on my short list of questions for round two, when we know each other a little better. 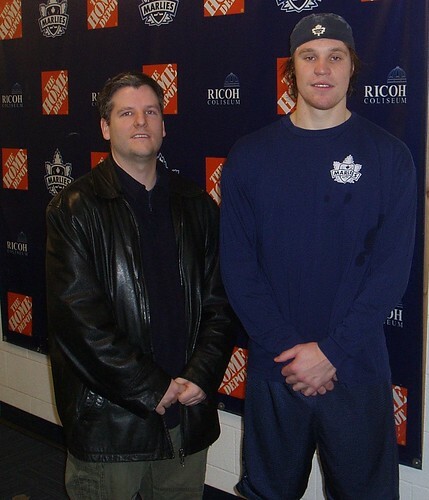 While he was changing out of his gear, me and the pr guy played a little game of "name the elite players drafted by the Maple Leafs in the past 30 years". Thanks for asking Pogge my question Mike! I can brag on my blog that I vicariously asked a Leaf an interview question. Cool.